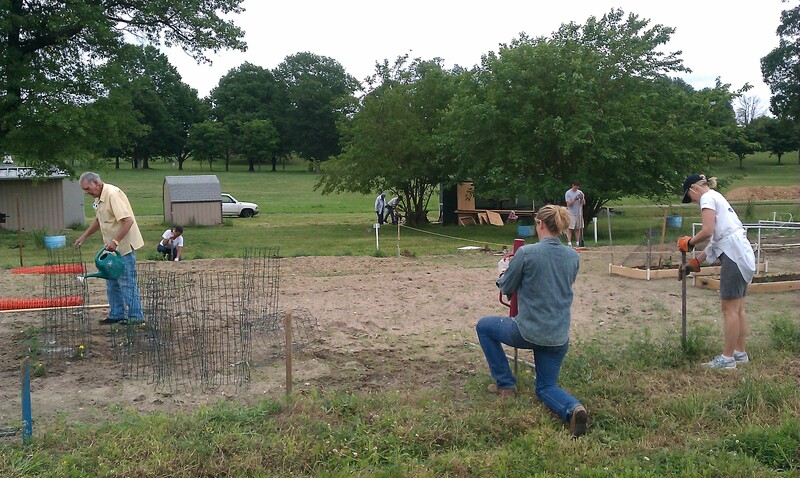 Volunteers and AFRH residents preparing the garden plots for planting, Spring 2012. Friends of the Soldiers Home is happy to announce the second season of community gardening at the Armed Forces Retirement Home! Friends volunteers have an opportunity to garden plots of their own in exchange for assisting resident gardeners with their plots. In the first year of this wonderful program we saw more veterans choosing to have gardens at the Home than at any time in several years. Friendships formed, and deepened, among veterans and community volunteers. We are so excited about what the second season will bring! Whether you would be new to the program or returning from last year, you must express an interest by e-mailing Carrie Green by no later than Wednesday, March 27 at gardenerofsoldiers @ gmail.com Carrie is the coordinator of the garden project for Friends of the Soldiers Home. The number of community volunteers we can accommodate in this program is tied to the number of residents who sign up to participate. So space is limited. We don’t expect to have room for everyone who expresses an interest, but we will do our very best to work with the Home to fit in as many people as possible. Carrie will notify community members if there is space for them on April 1. Friends requests a $20 donation per community member who gardens. Volunteers must be willing to undergo background checks by the Armed Forces Retirement Home staff. New garden volunteers will need to attend one of two orientation meetings with the Home’s volunteer coordinator, either on Friday, April 5th, from 1:30 p.m. to 3:30 p.m., or Saturday, April 6th, from 9 a.m. to 11 a.m.
New volunteers also need to attend an orientation with the Home’s garden coordinator on Sunday, April 7th at 4 p.m.
Gardener volunteers returning from last year don’t need to attend the session with the volunteer coordinator, but they must meet with the garden coordinator on Wednesday, April 3, at 7 p.m.Questions? Contact Carrie Green at the address above. The Friends of the Soldiers Home is seeking volunteers to help us host a Happy Hour with our veteran friends in their brand new Scott Commons. If you can give us two hours next Tuesday, March 26th, from 6 p.m.-8 p.m., please email Mary Bucci. Mary will send out a note to those who volunteer with specifics on where to park, if you are arriving by car, and where to meet. The Friends of the Soldiers Home had a nice Jingo event last week. The new building is just gorgeous for those of you who haven’t been yet. All of us from Friends of the Soldiers Home are looking forward to seeing old Friends next week and to meeting new Friends as well! 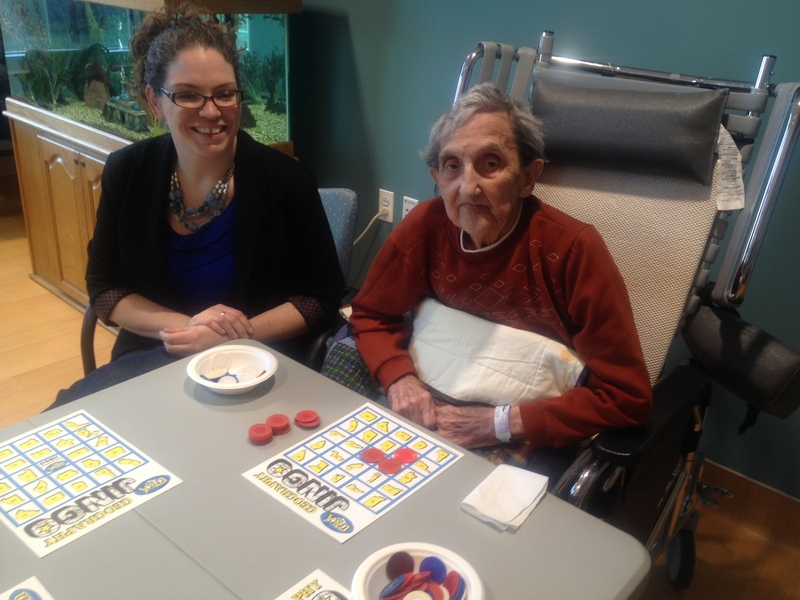 Friends of the Soldiers Home had a great Jingo night at the Home the evening of Thursday, March 14. It was our first look at Scott Commons, our veteran friends’ new home. The place was gorgeous and filled with homey comforts and amenities. It will be wonderful to share this great space with them for years to come as we continue to volunteer and hopefully bring some fun and warmth and opportunities for games and gathering together. There were several lucky winners in the game of geography Jingo in a beautiful new third-floor space with gorgeous views of two historic gems, Lincoln’s Cottage and the Sherman Building. But there were no luckier people than Friends of the Home, who got a chance to spend time with veterans and give something back to those who have given us so much. We can’t wait to return when we help with Happy Hour on March 26th! Greetings! We are seeking volunteers for our first Jingo event with our veterans in their brand new Scott Commons. If you can give us two hours next Thursday, March 14th, from 6pm-8pm, please let us know at volunteerfriendsofsoldiers (at) gmail.com. We’ll send a note to those who volunteer with specifics on where to park if you are arriving by car, and where we’ll meet. We can’t wait to see everyone and check on how they are adjusting to their new digs. Looking forward to seeing old Friends next week and to meeting new Friends as well!